Bachata is one of the most popular styles of social dance on the UK Latin dance scene. This dance is based on an easy to follow sequence of three on-beat steps, with a tap marking the fourth beat. It is styled with a fluid and seductive sway of the hips which is mesmerising to watch and just wonderful to dance! 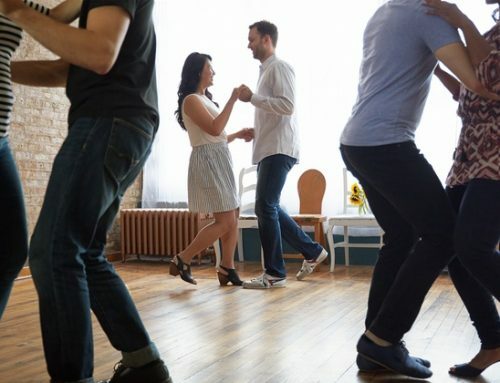 Bachata’s simplicity makes it a very beginner-friendly dance, while the opportunity for musical interpretation it provides makes it truly addictive for dancers of all levels. Bachata originated in the Dominican Republic and can be traced back to the early 1960’s. Like many other dance styles, Bachata shares a name with the genre of music which inspired its development. Traditional Bachata music, which dates back to the early 20th century, combines European musical elements with Afro-Caribbean rhythms and can be most easily identified by its prevalent, syncopated guitar line – which is still a key characteristic of popular Bachata music today! In its earliest days, Bachata music was known as “Musica del Amargue”, which can be roughly translated to “music of bitterness”. Both the music and the dance spoke of anguish, oppression and heartbreak. Like the North American Blues, it was danced by the poorest among the population, restricted to rural communities, brothels, bars and other entertainment venues which were shunned by the rich and privileged. Due to the opinion held by the societal elite that Bachata was a crude and unsophisticated dance of the lower classes, it failed to gain wider acceptance until the mid-1980’s. By the end of the 20th century, Bachata had gradually infiltrated mainstream society in the Dominican Republic and was starting to appear on the international Latin and Ballroom circuit. Over the years, Bachata was continuously reinvented as new dance professionals applied their own styles to the dance. These “versions” of Bachata were then taken up and popularized across the international dance scene. Though there is some disagreement within this community over the naming and authenticity of these Bachata ‘sub-styles’, three are generally recognised: Dominican, Moderna and Sensual. Of the three sub-styles, this is the closest to its authentic, original form. Unlike other adaptations, Dominican Bachata is built around a square “box-step”. It is usually danced in close partnership; the steps themselves are kept simple. This style features a smooth sway of the hips accentuated equally on every count. As you may have guessed by the name, this style of Bachata is a modern adaptation of the original dance. It incorporates more upper-body movements and more highly accentuated lower-body styling. Bachata Moderna adopts many of the turn patterns common in Salsa and is built around a “side-together-side” basic step, rather than the traditional square pattern. This is the youngest of the three sub-styles. Sensual Bachata uses the same basic step pattern as Moderna but less complex turn patterns. The movement within this sub-style is very much dictated by a dynamic interpretation of the music; it is characterized by fluid, whole-body stylistic movements such as body waves as well as shoulder, rib-cage and hip isolations. At Dancing Fever, we teach a hybrid style known as Bachata Fusion which incorporates elements from each of the above mentioned sub-styles. This allows our students to experience a taste of everything that contemporary Bachata has to offer. The variety taught in Bachata Fusion provides a wide range of movement possibilities for social dancing situations that will suit every dancer’s individual style and preference.